This makes me so happy, after such a horrible winter I am ready to know that we are looking behind at this one. Most of the snow has melted where I am but those temperatures are staying down. Usually by this time of the year my crocus have come out and then we get one final blast of winter which kills them. Right now the ground is still pretty frozen so no bulbs making appearances yet. I am not losing hope because winter is officially over. Arielle had a rough week loosing all her files but she has a fantastic sketch today to share with us that she created from a card created by me. In keeping with spring I used paper from Echo Park's Sunny Days Ahead. I just picked the 6 x 6 pad up on Friday when I was on a road trip with hubby. I combined it with some stamps from Simon Says Abby's Spring Showers, some Copic colouring for the 30 Day Coloring Challenge and some tiny raindrops that Natasha Kara kindly passed on to me when I was at her house in the summer! The coloured panel was popped up with foam tape. The last detail is that I painted some clear Wink of Stella on the top of the umbrella in my photo to give the illusion of being wet from the rain. I have been texting with my daughter every day that she has been in Europe. Not long conversation but the basics--how was your day? what did you see? what did you eat? Just enough to know that she is okay. Wifi is a bit sketchy. I kept pestering her to put some photos on Instagram. 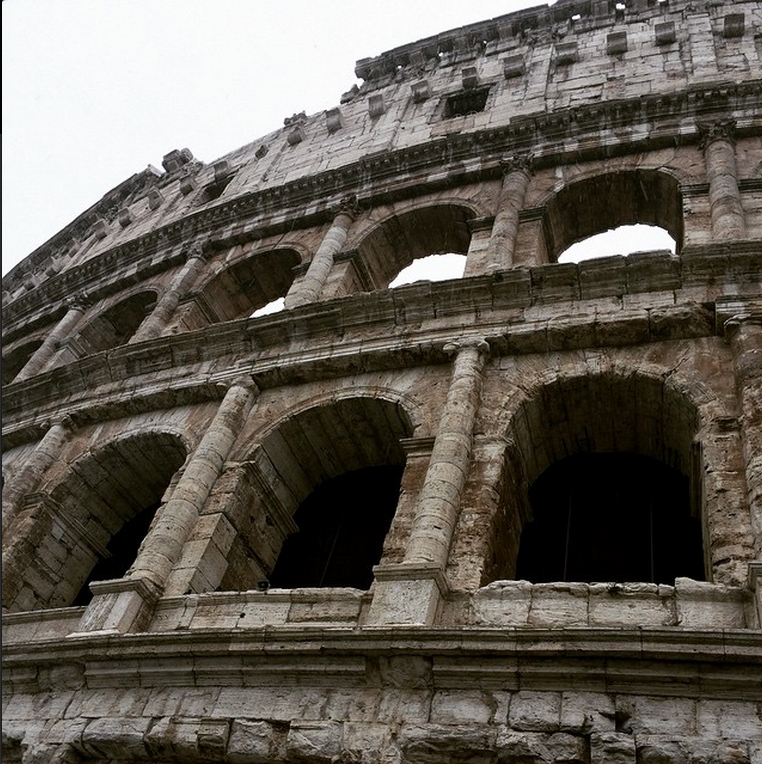 Well two random photos showed up today, one of the Colosseum in Rome and one of her and a friend in Greece. Apparently she has been taking lots of photos with her camera too, so there will be more to share. She is home tomorrow evening with what I am sure is lots to talk about! Amazing trip for her to take and I am so happy she had the opportunity, but will be glad to have her home again too. Definitely feeling more Spring-like after seeing this darling little card.. love the galoshes!! thanks for sharing Greece with us, Brooklyn! Great pictures, too! Fantastic memories for your daughter for sure! Your card is beautiful! LOVING the umbrella!! And loving her vacay photos!!!!!! 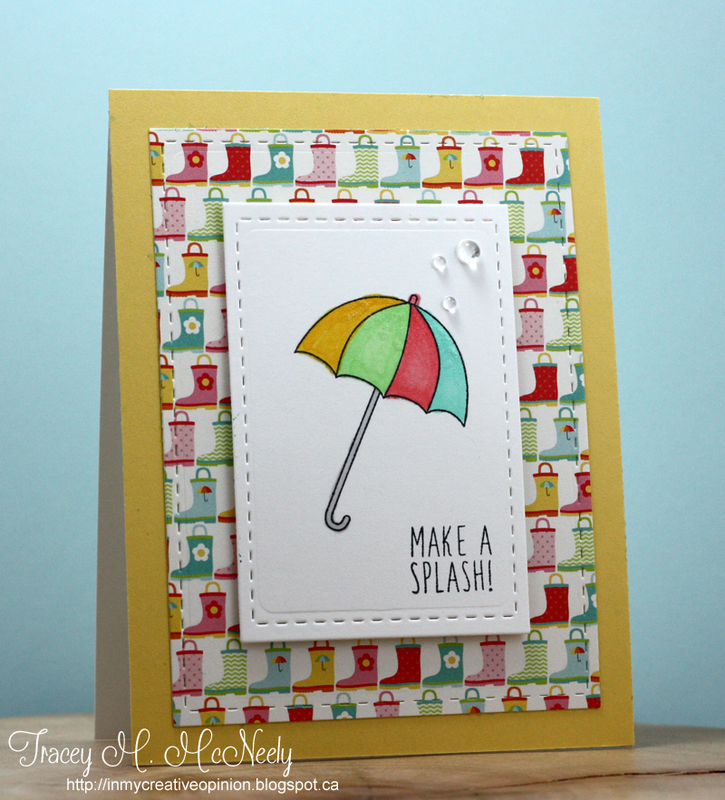 The patterned paper is so cute, Tracey, and you matched the umbrella with your coloring. Those raindrops add just the perfect finishing touch. Cute card Tracey! I hope it doesn't foreshadow a rainy spring in our future! Your card is just so sweet. Love that rainboot paper, so fun. I plan to look for that tomorrow while I am out shopping with Darnell. Just the perfect use of rain stones too, so so fun. I love Brooklyn's photos too, can't wait to see more! It's so bright and springy and those rain dots are super cool! I'm sure you will be MIA for a day or two after your daughter gets home with all the catching up and sighing in relief you'll be doing. This is such a happy card Tracey. It is a Seattle card. I love the background paper and the raindrops. Amazing pictures! Can't wait to see more...and an adorable card. Love those rain boots! That card is fantastic! The colors and the glitter on the umbrella are fantastic!!! & I adore that patterned paper. 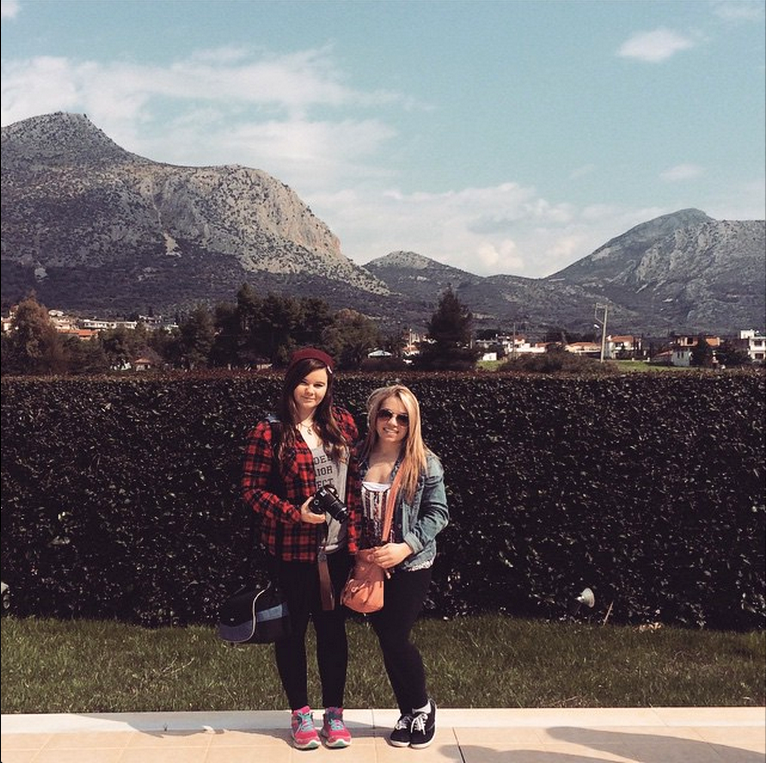 Your daughters trip looks amazing! LOVE this...that paper is too stinkin' cute! 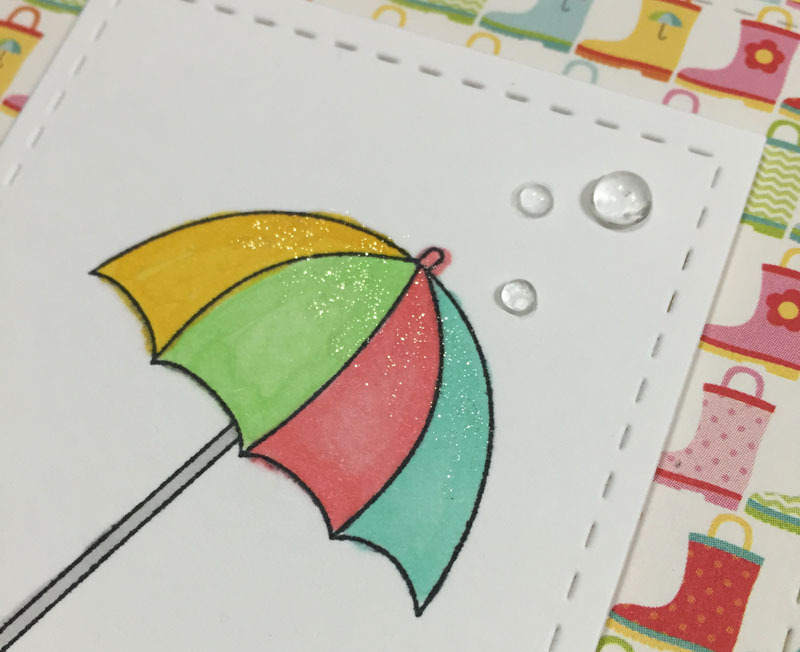 I love this card and the bit of shimmer on the umbrella! The patterned paper is perfect with that stamp. Thanks for sharing some of the pictures ! Such a charming card, Tracey! I love the umbrella and how you added those cute little rain drops! Love the fun patterned papers you chose for this card, too! Thanks for the photos! Can't wait to see more! 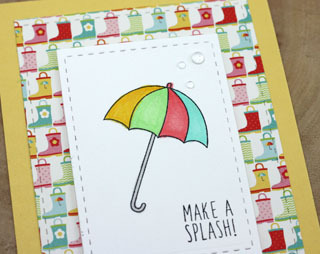 Super fun card--love the patterned paper and your colorful umbrella! Your umbrella, paired with the darling background boots paper, has me in awe! Feeling the 'spring' emanating from it! Great to know your sweet daughter had a fabulous trip...memories made!